Ever so often in this business, we see something that makes us truly humble and amazed at the accomplishments of our fellow artisans. 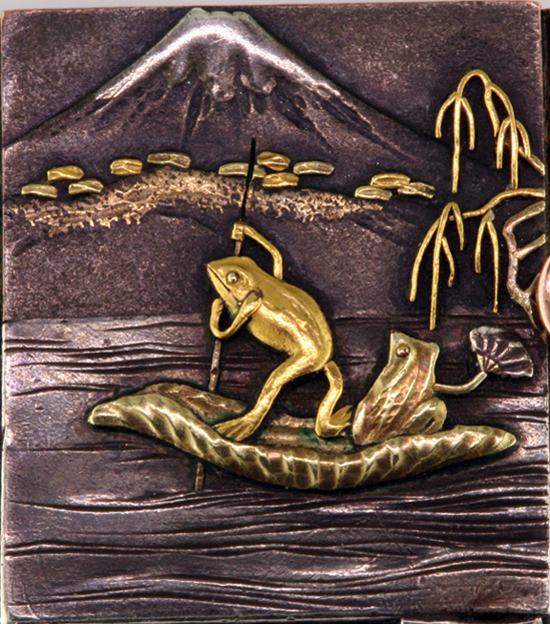 The Frog Boatman tells it all when you realize that this panel is less than an inch high. 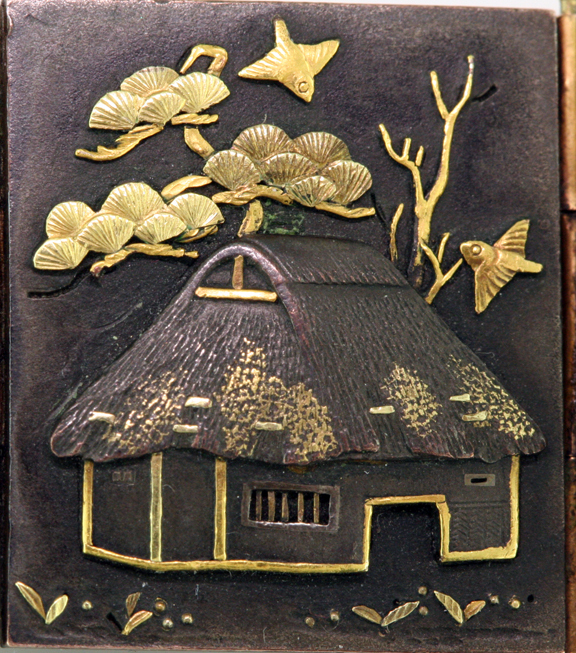 We recently had the privilege of working with this wonderful Japanese bracelet– we think Meiji period or a little later. 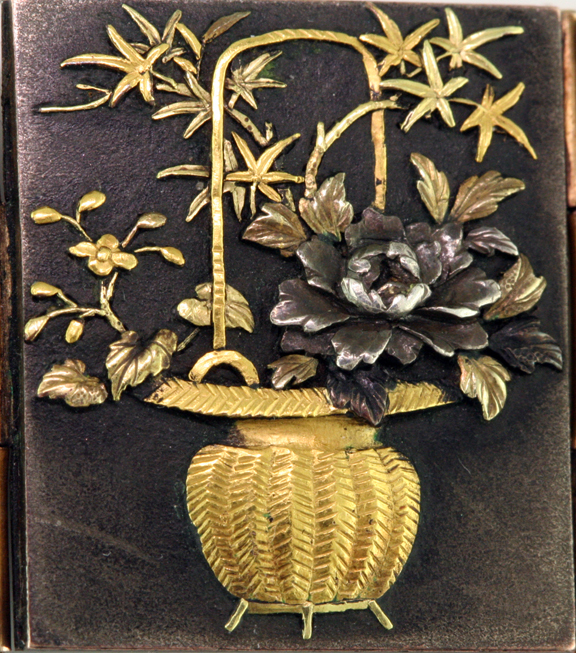 We’ve seen this level of metal work on old Samurai swords, etc, but never on jewelry. The unsigned bracelet, weighing 60.7 grams, is composed of nine panels, each measuring about 21h x 18w x 1.5d, which appear to be bronze overlaid and inlaid with various qualities of gold and silver. I initially thought the dark base metal might be steel, but it’s not magnetic. The panels are joined with tube hinges that are only about 1 mm in diameter–fine work! The bracelet closes with a beautifully fitted box clasp. The piece shows some age, with missing inlays on a number of the panels, but even so, the impression one gets from each panel–thrilling! 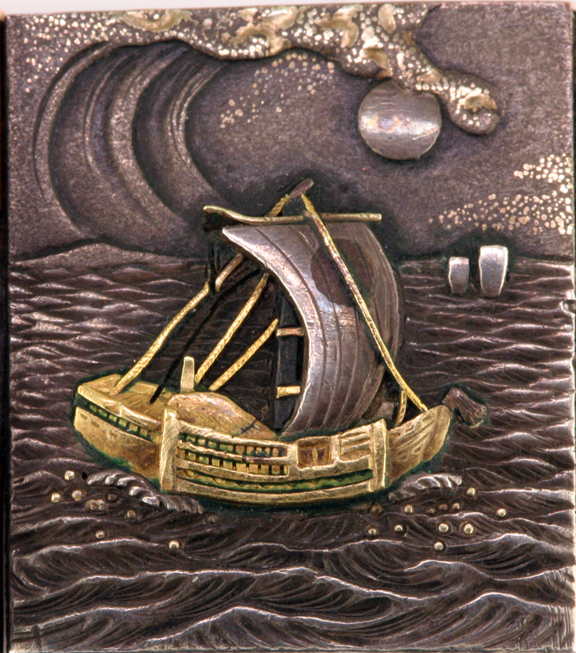 Starting with the Boatman at the male end, each panel is exquisitely composed and wonderfully crafted. 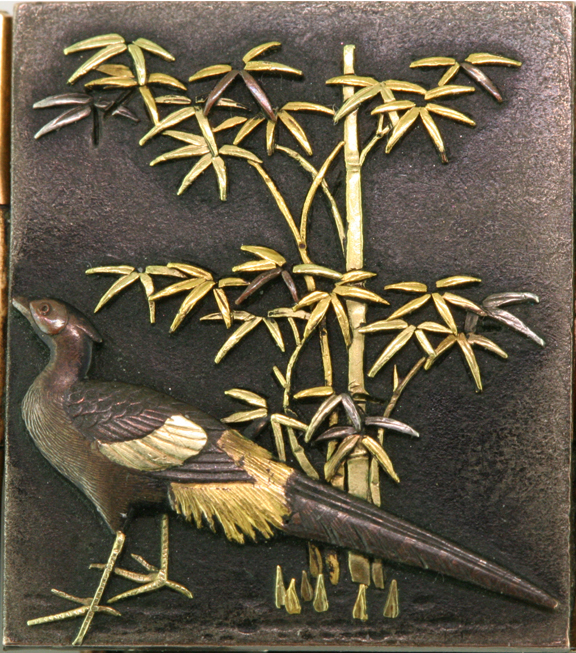 Notice the detail- the scales on the legs and feet of the bird, the lotus stems and sprouts, the seeds in the lotus pods. 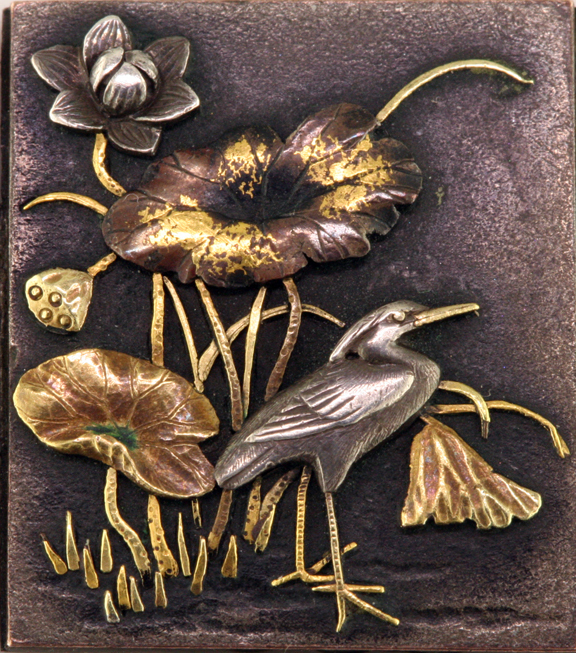 The beautiful composition is accented with delicate colorings on the gold and silver inlays and overlays. 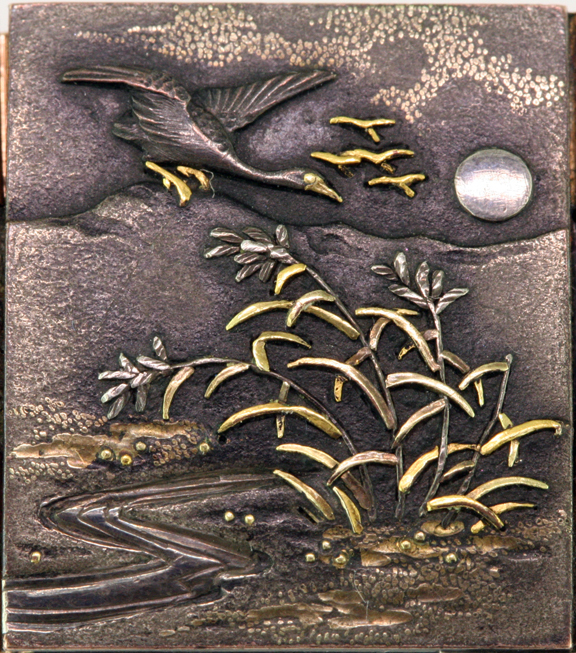 This beautiful fable shows a flock of cranes descending in the moonlight to gather rice grains–note the delicate clouds around the moon, created with subtle overlays. The view of the thatch roof accented with gold overlay is curiously much more sophisticated in perspective than the rest of the cottage. Note the sprouting plants in the foreground. Beautifully colored inlays, overlays, and shadings. 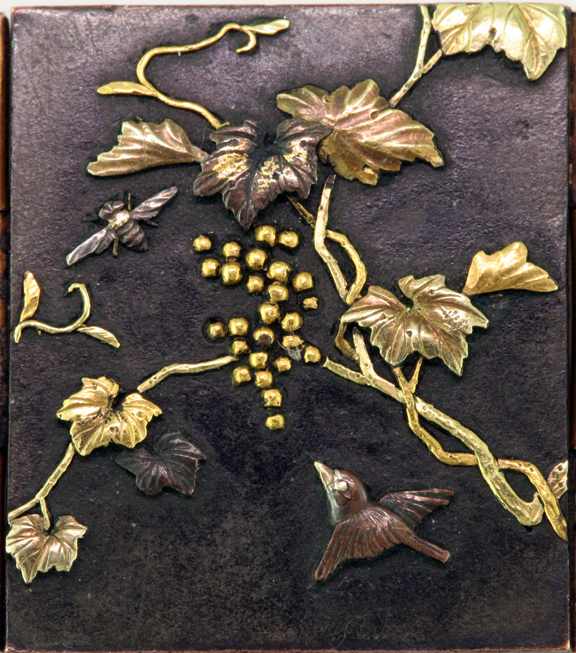 The naturalistic composition reminds us why the Art Nouveau period was so much influenced by Japanese art. Bamboo shoots, veins in the feathers, scales on the feet, the joints in the bamboo stalk, such wonderful detail and balance in a canvas less than an inch high! Such drama–the sailors sleep, unaware of their impending doom on a moonlit night! Evokes the iconic “Great Wave off Kanagawa” by Hokusai. Such a reserved and minimalistic composition, yet so expressive, so beautifully sculpted! If anyone knows specifics or details about this bracelet, workmanship, dates, or artist, I would welcome your comments or reply by email. Our Estate department features wonderful jewelry like this, each piece a survivor, each piece with a story. We’re finding new pieces all the time, and welcome consignments. If you love period jewelry, be sure to check our website on a regular basis– just clik the estate jewelry button on our home page for a catalog of current stock, or use the search feature if you’re looking for something specific. And, if you’ve looked and haven’t found what you want, give us a call–we can often locate a piece from one of our estate dealers. This entry was posted on Saturday, May 2nd, 2009 at 4:17 pm	and is filed under Estate Jewelry, Jewelry Facts. You can follow any responses to this entry through the RSS 2.0 feed. Both comments and pings are currently closed. I read the recent blog posting about the Frog Boatman bracelet that was mentioned on the Orchid list. What a great piece, thanks for sharing that. 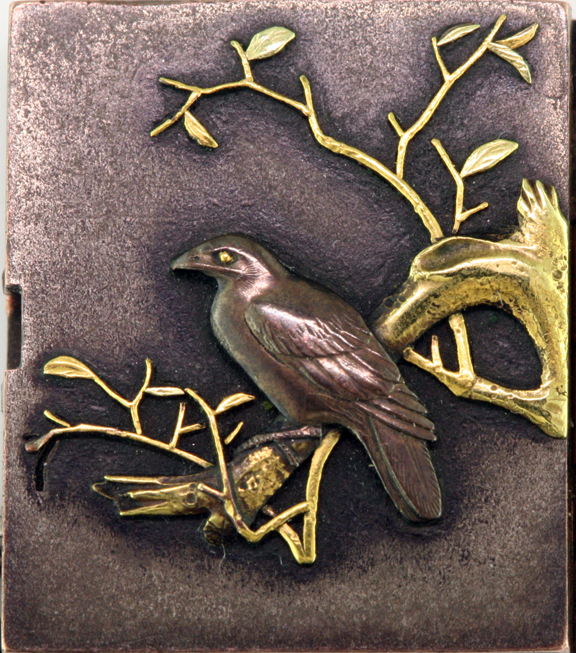 Unfortunately I can’t offer any information on the piece but you might consider one of the Japanese alloys like Shakudo or Shibuichi, which can be alloyed in a range of mixtures taking on a variety of colors and characteristics including a numerous and unique patinas. What particularly caught my eye in this post was the part about how sword makers had to modify their craft during/after the Meiji era. My husband Yas comes from a family line of just such craftsmen. The type of work his family lineage does is quite different from the bracelet but it represents another venue that the displaced sword makers took. What an extraordinary and exquisite thing. I don’t think I’ve ever seen a more amazing collection of individual artworks.